1. Hard boil the eggs for about 10 minutes then cool in ice water. Reserve at room temperature if meal being prepared soon. 2. Saute the shrimp in sesame oil until pink and no longer translucent. Then reserve in a warming oven with the bowls. Alternatively shrimp can be grilled. 3. Dry the scallops and saute in the same pan and oil until they start to brown on the edges and are no longer translucent. Reserve with the shrimp. Alternatively they can be grilled also. Reserve the oil for the soup. 4. Wash, dry and cut the vegetables to size while the cooking is going on. 1. Pour the fish stock into a suitable pot. 2. Add the tamari sauce, cooking oil from fish, and sliced ginger and stir to mix while bringing to a simmer. 1. Place the fresh angel hair pasta noodles in the bottom of two shallow bowls and while the soup is still hot, pour it over the noodles to a depth that barely covers them. 2. 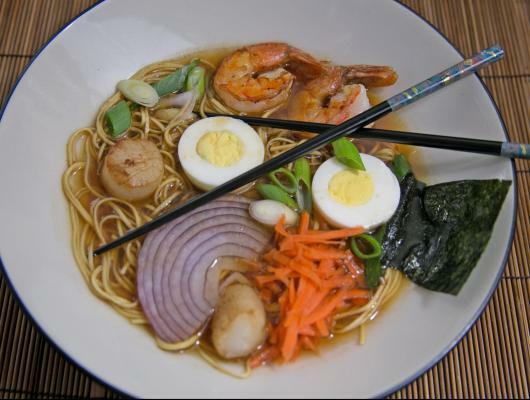 Arrange the seafood and vegetables carefully on top of and around the noodles so that everything is level with the top of the soup and is attractively placed. 3. Carefully slide the nori into the edge of the soup only partially submerging it. 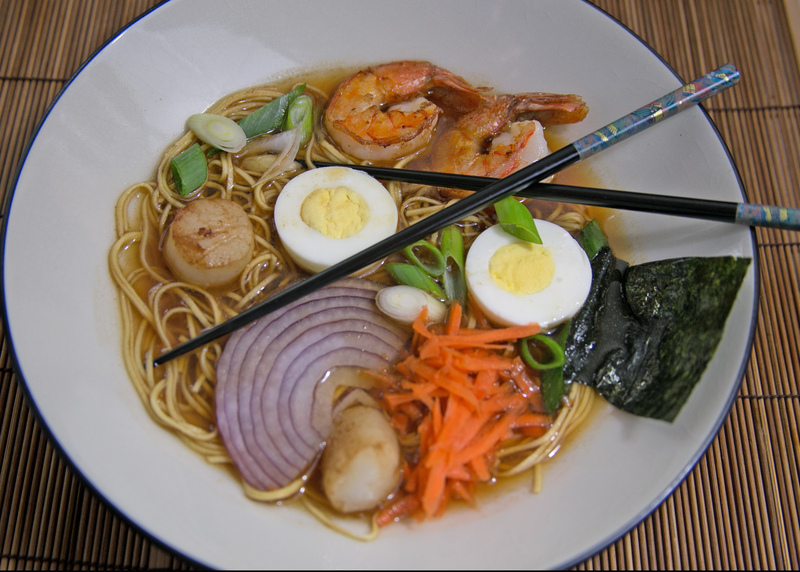 Seafood Ramen Noodle Soup is traditionally made with pork, chicken or seafood. Today's dish has a base of our homemade fish stock made with seafood as the main protein. We added tamari sauce and sesame oil used for sauteing the seafood. It is a simple soup to make and we used fresh angel hair noodles as a substitute for the ramen noodles.